Searching for the perfect vacation retreat, a place where the cares and worries of the world melt away into rolling mountain vistas, into fresh air and blue skies? Come to the quiet little mountain town of Lake Lure and discover a place where heaven and earth meet on the mountaintops: 221 Half Moon Mile. 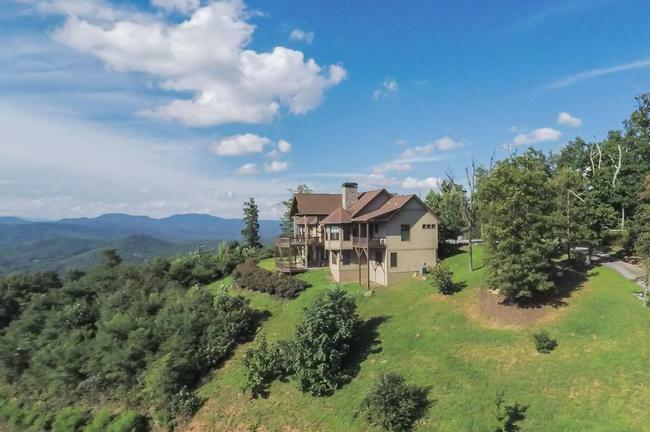 Perched on a solitary hilltop in the gated luxury neighborhood of Bill’s Mountain in Lake Lure, this absolutely stunning vacation home offers six bedrooms, four and a half bathrooms—and dazzling 360 degree views over the Blue Ridge Mountains (including sites like Grandfather Mountain, Mt. Mitchell, Linville Gorge, Chimney Rock, Hickory Nut Gorge, and Lake Lure). Step inside and discover your next vacation destination. 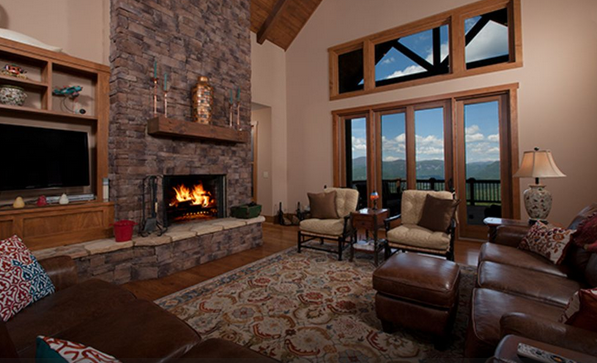 The stunning 2-story greatroom features a cozy country elegance with a stone fireplace and exposed beams… complete with absolute breathtaking mountain views from its nearly floor-to-ceiling windows. Set the table in a lavish setting beneath a charming chandelier—with plenty of room for extended family, friends, guests, and more. Don’t leave the luxuries of home behind! 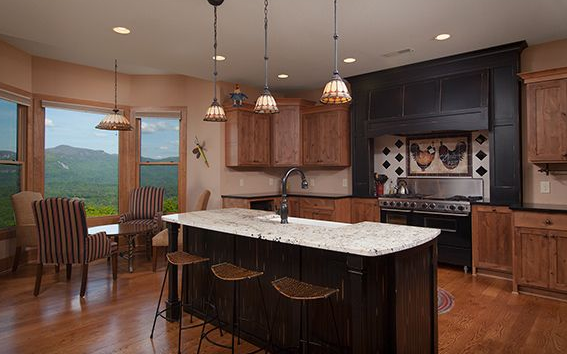 In this beautiful gourmet kitchen, you can still enjoy all the high-end features and amenities you love about your home kitchen, like granite counters, island bar seating, custom lighting, and stainless steel appliances. 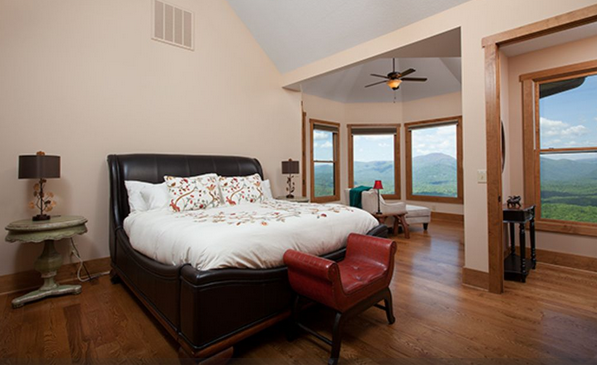 Plus, you get to wake up to coffee or breakfast in a bay-window breakfast nook complete with Blue Ridge views you probably don’t get back home. Just because it’s not the master suite, doesn’t mean it’s not fully equipped with its own comforts (like the sitting room) and views. You don’t even have to leave home to host a fun game night or entertain the kids on a rainy day! 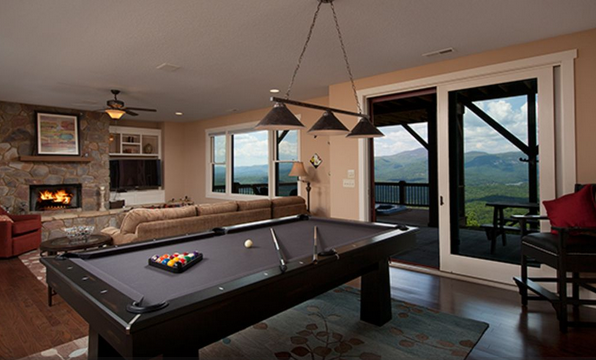 Stay home, play some pool, enjoy a movie, or gather with friends in the cozy game room. As marvelous as the interior may be, you’ll love the outside even more. Like the spacious deck, complete with room for sitting, outdoor dining… and even a hot tub for relaxing under the stars (you’ll be shocked at how many stars there are out here)! We weren’t kidding when we said “heaven on earth” or “door to the sky”. 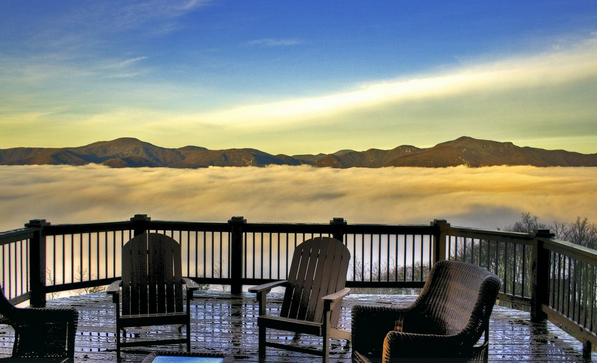 This home is literally above the clouds. And sunsets above the clouds are pretty extravagant affairs. 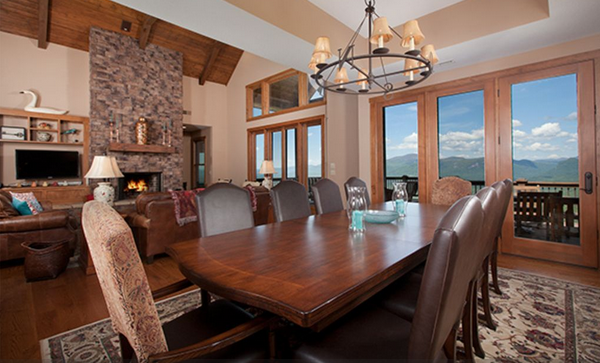 Ready to Make This Stunning Hilltop Home Your Next Vacation Retreat? If you aren’t ready to drop everything and come to 221 Half Moon Mile yet, we’ll be surprised! 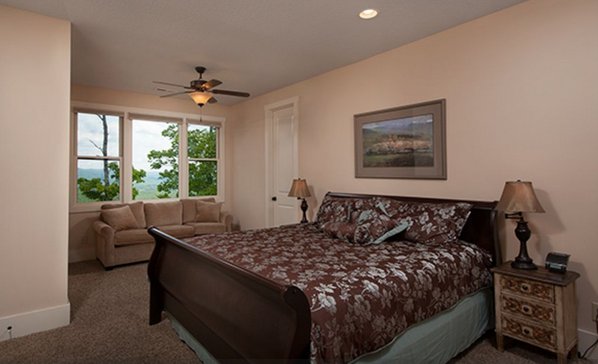 Contact Cielo Real Estate today to learn more or to get started planning your vacation to Lake Lure at this home. Not quite the right fit? We’ve got plenty more vacation properties to offer, no matter what you’re looking for. 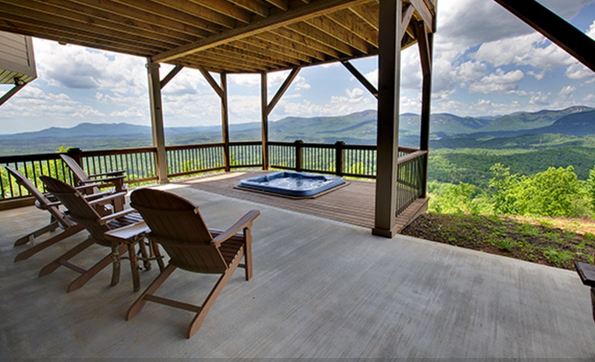 Thinking of buying a vacation home in Western NC? We can help you find the perfect home for sale, too!